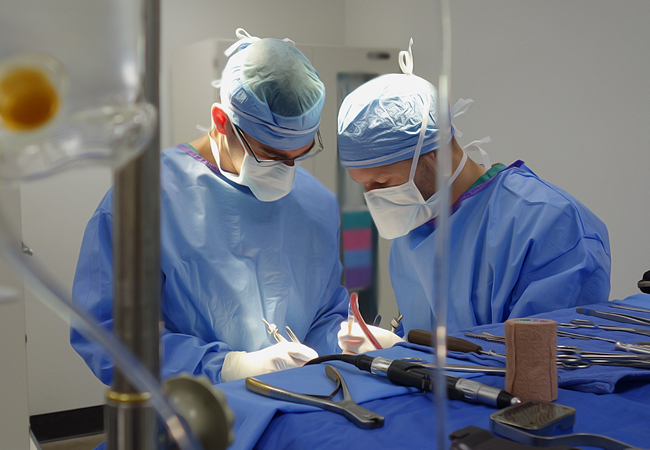 The Surgery Department provides routine services and advanced procedures including orthopedic, neurologic, soft tissue, oncologic, micro-vascular, and minimally-invasive surgeries. Our surgeons regularly attend national and regional conferences and lectures to stay up-to-date with the latest, specialized equipment and techniques. Our facility houses cutting-edge diagnostic imaging capabilities such as x-ray, ultrasound, and CT scans, allowing us to “see” abnormalities in your pet’s body. To ensure your pet receives the highest quality of care, an emphasis is placed on safety, post-operative comfort, and appropriate pain management. Our highly-skilled surgery team, consisting of board-certified surgeons and veterinary technicians, performs a physical exam and pre-anesthetic testing before surgery. They make sure that the safest anesthetic agents are used and that your pet is closely monitored throughout the anesthetic period. To receive the best possible outcome, we administer the appropriate pain medication to keep your pet comfortable during recovery. It is extremely important to follow-up with the Surgery Department for post-operative care to make sure the surgical site is healing properly. This is why our team is available by appointment and on-call for emergencies around the clock, alongside specialized staff to make sure your pet is given optimal care, any time of the day.